The Adelaide Hills Council – Transport Asset Management Plan is available here. 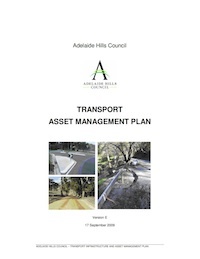 This Transportation Asset Management Plan was developed for the Adelaide Hills Council. The Plan is meant to be read in conjunction with existing documents, including the council’s Strategic Management Plan, the Development Plan, and the Long Term Financial Plan. The plan highlights the agency goals and objectives concerning asset management and covers the following topics: desired level of service, lifecycle management, future demand, asset management practices, performance monitoring, a financial summary, and an improvement plan. This document includes the following sections: Asset Valuation, Communications and Reporting, Current Methods and Tools, Data Management, Financial Plan, Future Demand, Introduction, Inventory and Condition, Investment Strategies, Levels of Service, Lifecycle Management, Objectives and Measures, Performance Assessment, Process Improvements, Risk Management.